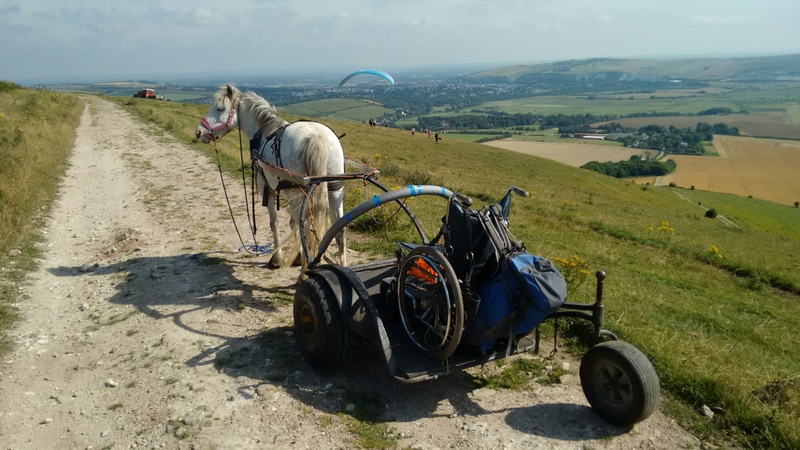 PonyAxeS drove, summer 2016, in a wheelchair, the full length of the South Downs Way from Winchester to Beachy Head to celebrate the fact the South Downs Way becoming the first fully inclusive National Trail. Starting from Winchester in late July, we reached Beachy Head in early August. It was slow because the trip wasn’t a race, it was all about access, not a Bear Grylls survival challenge. River Itchen, Winchester, view from a wheelchair. I took Obama, and Toby, my new pony. 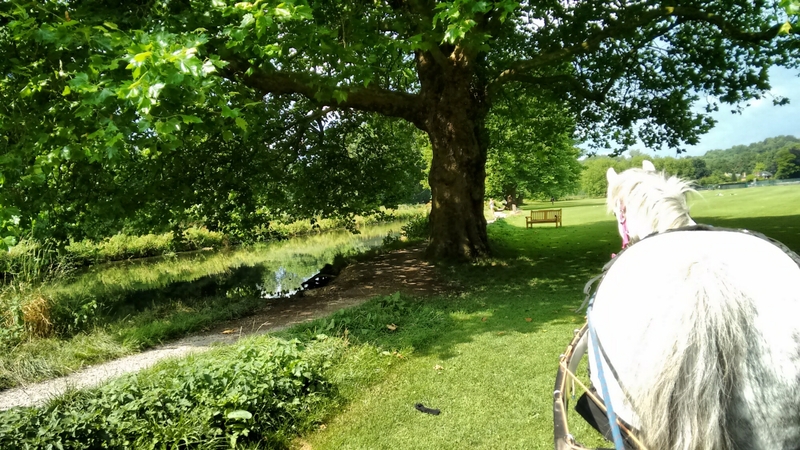 Obama had just had mild laminitis and I didn’t want to push him, and Toby had only been driving, only been bitless, and only been barefoot; for a few weeks, so had a lot to learn. By the time we reached Beachy head, we had all learned a lot. Obama had drifted, running loose for most of the way. Toby had become a tough, competent pony, and enormous fun when Obama decided to lead him astray. The South Downs Way is the first fully accessible National Trail, in the world. You don’t need to do it as fast, you don’t need to do it all, but the choice is yours. Obama, or Toby, or any pony, can take you, from Winchester To Beachy Head, in your own wheelchair, in safety. Paragliders, ponies and wheelchairs in one photo. The South Downs Way National Trail is inclusive. The South Downs Way is incredible. 100 miles of cross country, off road travel. Amazing scenery, stunning views, awesome birds, butterflies, wild flower meadows and silence. You can stop and think, and just not hear the modern world. Civilisation is a patchwork quilt laid out below you. Up here, on the South Downs Way, life continues as it has for thousands of years. But with added walkers, bikers, hang gliders, dog walkers, and now anyone who uses a wheelchair can join the fun. 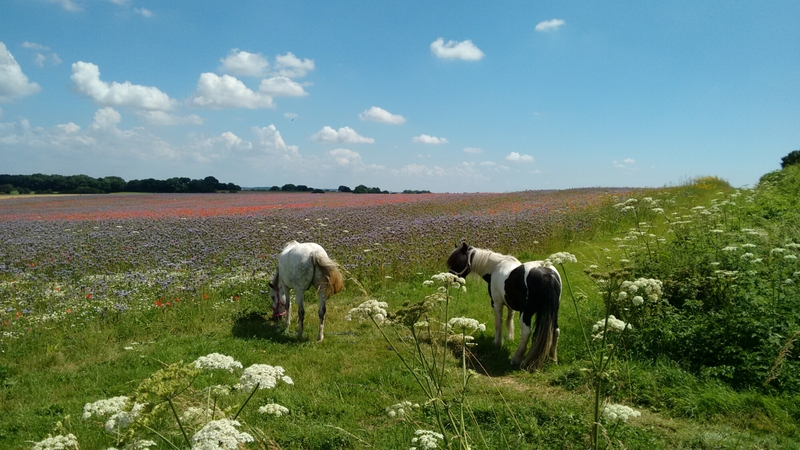 Wild flowers, loose ponies, view from a wheelchair. Many thanks to Andy Gattiker and all at the South Downs Way National Trail for all their help, encouragement and support.